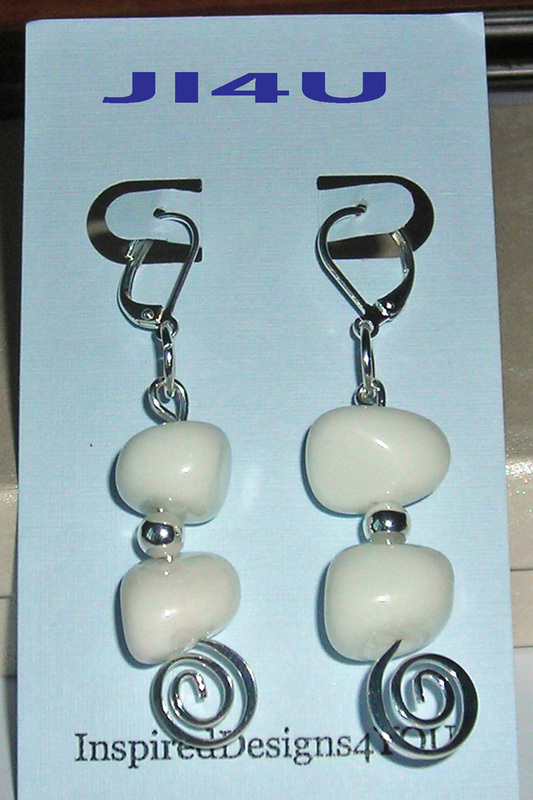 White Agate Earrings. 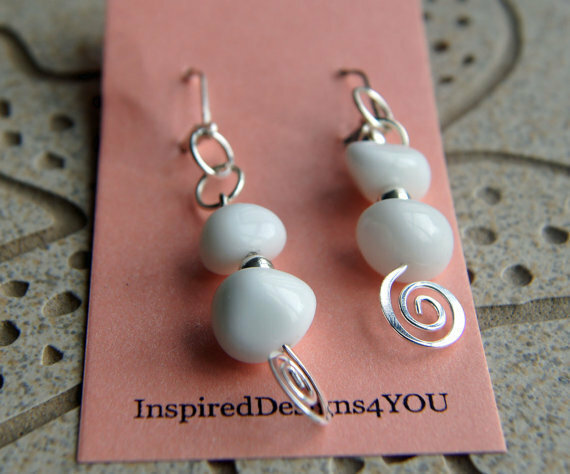 Stunning White Gemstone Dangle Earrings. 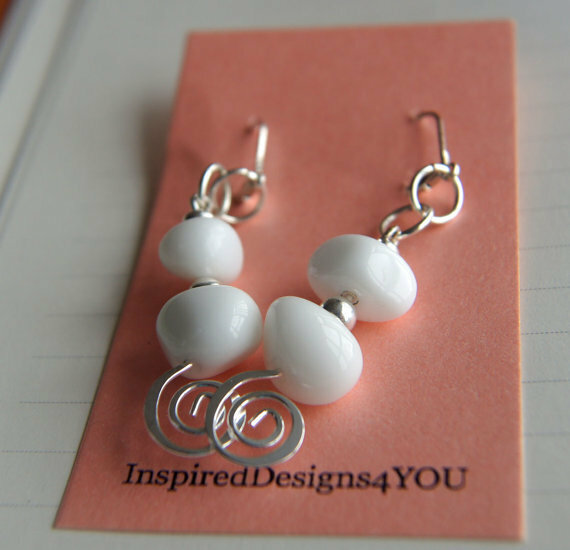 White earrings complimented with the silver sterling. The simplicity of the design and elegance are matched with the lovely spiral pattern, featuring the 9.25 spiral earrings. The agates are stacked nestling perfectly in my handmade custom design accented with silver beading. The elements are brought together giving a 'Roman or Grecian' effect. White Agate nuggets, each shape is unique to it's own. One of a kind, smooth, luster with marble smoothness. Agate is characterized by finest grain and colour in these beauties. For the beach, for play, for your heart .....will ever be captured when you wear these. White earrings. Each nugget is hand selected by me. Suspended on 2 jump rings and finished with lever back 925 sterling silver self closing ear wires. All components are hypo-allergenic and nickle free for your wearing pleasure. These are lightweight to medium. I pride myself on the best gemstones for my customers. Inspiration: These earrings were inspired for a great friend, I called them "Shelleys Style" created for her birthday. This depicts her style: "Sophisticated, confident, simply taking you anywhere you want to go and transitions from day, shopping, evening and in between Thanks "Shel Bell". Ear closures: generally two style "Lever back" (or also commonly known as lobster clasp due to is shape and how it closes). I recommend this type for when using gemstones. Fish hook: simply hooks through the ear lob and is also known as "Shepherd's Hook" due to the shape. These are generally used for beaded or crystal earrings, with silicon backing for comfort. These are available to be shipped in 2-3 days. Shipping is via Canada Post International post and will take from 6-14 days to reach you depending on where you life. Please ask me about tracking in Canada and in Continental USA, and additional charge would be 8.00 over and above normal shipping, no signature is required but you will be able to track the item. Kindly provide 1) email and 2) phone number for all items being shipped outside Canada. May I recommended expedited shipping (or tracked) status updates via email on the progress of your shipped item. There is no guarantee of regular post as from time to time, items can go missing which is out of my control unfortunately or if UPS (United States Postal Service loses the item). Please contact me if you need help with your selection, we are most happy to be of service! 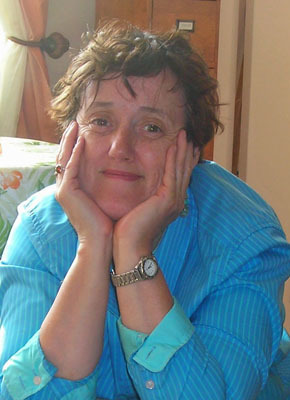 Yes, that's me in the photo, nothing makes me happier that to create for YOU and your loved one.